E. F. Benson - The Flint Knife | Vault Of Evil: Brit Horror Pulp Plus! In our old country house, the kitchen ceiling boards bulged down ominously from the weight of my book shelves upstairs (and I still only keep essential books and documents that I love, all excess not needed I have weeded out). When we moved, the furniture itself wasn't much of a problem; but a few trips with several boxes of books in the back of the car, transforming it into a lowrider and front wheels almost spinning in the air, made me a traffic hazard on the highway. I cherish a sort of buddhist philosophy, that one should not own more things than one can carry along on ones back; sounds beautiful, but that is not possible for a book collector. What if there is a society upheaval, civil war, anarchy, ... I see it coming, ... where do I go, and how do I handle all my stuff? Wish I could keep it all inside a magic bottle. Thank you for that report, ... now if I can only find pdf or word documents for "The Flint Knife" and "The Ape", to put in my computer digital library of various scraps and unsorted oddments, I will be well contented. I agree....I'd have a hard time choosing only 10 books to carry on my back, let alone anything else like spare clothes, etc. As for pdfs for those 2 stories, of course I looked before buying the book, but couldn't find any. Only The China Bowl is available (from gutenberg.au) which I (re) read last night. Come to the end of this book and its easy to understand why Benson himself elected not to preserve for posterity any of the stories it features in the major collections issued in his lifetime. With one or two inexplicable exceptions the stories simply didn't warrant it. The exceptions are the title story, which is a fine weird yarn, and "The Ape" too, for all the contentiousness surrounding its flawed ending, still has enough about it to suggest it warranted collecting also. And I can also see a case being made for "The Light in the Garden" as well which, despite boasting nothing beyond the usual trappings of a traditional ghost story, is nevertheless well done and suitably atmospheric. But as for the rest: as a Benson fan it pains me to say it but if he ever wrote anything worse than "The China Bowl" then I've never come across it. We are seriously expected to swallow a succession of ludicrous conceits. Not only are we given a murderer so stupid that not only does he bury the incriminating piece of crockery in his own garden but neglects to wash it first. He then rents the house out and goes to great lengths to draw the ignorant narrator's attention to the buried bowl by trespassing into the garden at the dead of night to look at the spot where he interred it. Its utterly absurd. While none of the other stories quite plumb these risible depths, any decent ideas they have are completely lost in woefully contrived scenarios. Admittedly some of the more feeble offerings - like "Sir Roger de Coverley" - may be explained by the sedate nature of the women's journals Benson was writing them for. But how to explain the sort of preposterous contrivance at work in "The Chippendale Mirror" and "The Passenger"? Where the book really suffers though is in its tiresome repetition of the same set ups; no less than five wives are murdered by husbands in the course of the book with one further wife meeting her end at the hands of a stranger, another dying in an accident and another running off with the protagonist's best friend [so much for Benson's conjectured philogyny]. Recently purchased or inherited properties requiring renovation are the jumping off points for five stories too. And I simply lost count of the amount of times I found myself reading of plunging temperatures and the brushing past of unseen people. Little blame can be accorded Benson himself of course for the repetitiousness of the material collected here but Adrian certainly did his reputation no favours by seeming to show such apparant limitations to his imagination. I can see that I wasn't the only one to dislike The Flint Knife. E.F. Benson's best stories can be found in the Robinson and Wordsworth Press omnibuses (omnibi?). 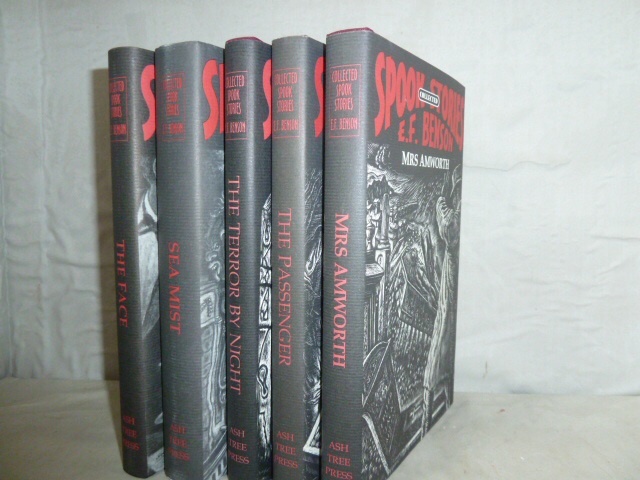 For fanatics, The Ash-Tree Press collected his complete spook stories in these five volumes. The China Bowl: (Pearson's Magazine, Dec. 1916). Benson rents luxury premises on ridiculously generous terms. The owner, Sir Arthur Braithwaite, finds living there too painful as it cannot help but serve as constant reminder of his late wife. As Benson soon discovers, the property comes complete with midnight prowler in the garden, horrible nightmares, and the ghastly pale spectre of Lady Braithwaite supping from a china bowl. Benson invites old friend Hugh Grainger to stay (given the amount of adventures he appears in, surely Hugh deserves psychic detective status?). Together they wait up for the ghost. Agree with Crom that this one is is a little *ahem* far fetched, but I can't help liking The China Bowl which might have been written specifically for an Edwin Baird issue of Weird Tales. The hilariously horrific finale pre-empts that of Birkin's sick classic Marjorie's On Starlight by over half a century. While Marjorie's On Starlight made a big impact on me, I can't remember anything about The China Bowl, which I read more recently. What happens? I won't tell. Yikes! I'm almost sorry that I asked. While I don't normally like purely physical horror, Marjorie's on Starlight is probably the best of its type that I've read. I picked up a copy of Glimpses Of The Unknown: Lost Ghost Stories edited by Mike Ashley (2018, British Library Publishing) the other day, and it's got EF Benson's "The Woman in the Veil" which is said to not have been reprinted since appearing in The Evening News in 1928. Unfortunately it's a fairly standard sort of ghost story, definitely nowhere near Benson's best. Only a couple of brief references to golf. British Library have a decent "Tales of the Weird" series going - a bit like what Wordsworth were doing not so long ago, but with a slightly higher cover price.